Get ready for the next local Ham Radio event, the Stone Mountain Hamfest, sponsored by the Alford Memorial Radio Club. Admission: $6 in advance, $8 at the gate. I've written an email to the Hamfest Chairman, Chris Balch (KS4MM), requesting information on what it would take to have a table at this hamfest. I'll keep y'all posted on any updates I receive, and once we get enough information we can submit this as an official event to HQ. I'm down. If my schedule stays the same, I have that weekend off already. I don't know jack about Ham, so this might be a good place to start. And, of course, I could man our table. Let us know when you've heard back. The sooner we can get an event request in, the better. The meeting will be centered around Anderson Power Pole Connectors (it's a compact way to secure 12-volt power lines at high amperage). While I'd be there specifically to ask about ZS having a table at the hamfest, it's open to anybody that wants to attend, if anyone else has the desire to check out a ham radio group in the area. Sorry, Thursdays are no good for me. I got a reply from the hamfest chairman, apparently the cost for other radio clubs is $75, which is still less than standard vendor prices. Though, that still didn't address the "we are a non-profit" angle, I'll have to get back to him on that. I made it to the AMRC meeting, and it was very welcoming to step into a group of people eager to teach everything there is to know about powerpole connectors. While the Hamfest chairman wasn't there, the club president was. He took my application, and confirmed our place at the Hamfest with a club table. While the exact location has yet to be determined, we should be in the same building we were before, the Main Exhibitor Hall. 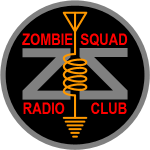 They know we are Zombie Squad, and that we are attending both days of the Hamfest. Feel free to send an official event request to HQ. Just checking for understanding. We have a spot reserved as a club table, so that includes a $75 fee? And I haven't submitted anything to HQ about this, has anyone else? We need to get this in soon to make sure they have enough time to review it. I have no doubts that it will be approved, it's just a matter of being approved in time. This is in a week and a half, where are we with this? I'll be there, who else is coming? Do we need any supplies still? I may have to work that morning. I should be able to swing by for a while Saturday afternoon; Sunday will depend on how things work out. I've got confirmation of our table location, load in times, helpful facts from the people that run the show that I'll post in the OP. One thing of note: anybody that attends the hamfest, as well as everyone that man's the tables, needs an entry ticket. They are $6 in advance, or $8 at the gate, and this is good for both days. Kinda like Dragon Con, where you need a badge no matter what you do, except this is far more reasonable. Awesome! Just making sure we're all on the same page with this event, with it being so close and everything. Man, you guys have been quiet recently. Hopefully we'll liven things up a bit with this event. I'll be there bright and early tomorrow, and will be there all day. I'll be there bright and early Sunday as well, but I'll have to dip out around noon. I met two of you who were manning the booth at the Alford Memorial Radio Club Hamfest on Saturday afternoon. Signing up for this board seemed to be the best/only way for me to learn more about your organization. I am an amateur radio operator, KI4HQD, located near downtown Stone Mountain. I appreciated your members taking the time to have a booth at the Hamfest and appreciate that you're interested in educating folks about ham radio along with other subjects. I will try to read through the local and national boards to learn more, but since posting seemed to be the only way to announce my interest, here I am. Life and work are plenty busy for me already, but I appreciate the spirit of what I saw on Saturday and maybe I can contribute a little. I am have my licence, but am largely inactive, and I live just between Clarkston and Stone Mountain. Welcome to the boards. I hope that we will see you at at our meeting on Saturday. ps: I'll get this archived on one of my own servers soon, in case it's not on their site forever. That's awesome! I know we were invited back this year, but have we talked with them at all? Also, this year is flying by. I wanted to get my tech license here this year... I need to start studying.